I am not sure what my problem is but boy have the days been long. It seems like every day is get in the car get out the car eat get in the car get out of the car eat wash rinse repeat. There has been very little going on that is picture worthy and other than photographing stacks of clothes, my camera has stayed mostly in my bag. I do have a couple of pics though and then a few more words to add. This is from 2 weeks ago at 23 weeks. As you can see I have quite the belly already and, according to the doctor, I am measuring 2.5 weeks ahead of where I am supposed to be. I know that the tape measure isn't always accurate but yikes. I really really hope that when I go back in a couple of weeks things are as they should be and not larger. Maybe I should lay off the cookies and Sonic until then. Well, after today of course. Chloe modeling an outfit for me before MDO. 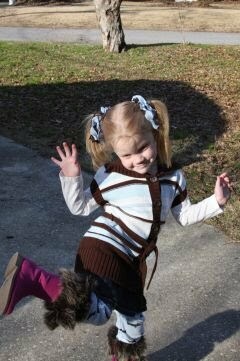 We had a head to toe ensemble going until she demanded to wear her awesome pink boots. They go with another head to toe cuteness overload outfit we have, with which she will only wear her crocs. I love her independent fashion sense. And really, does it matter if red and green Christmas socks with polar bears are teamed up with Matilda Jane on Sundays before church? Not in the least. And when we haven't been busy with school and dance, we have been showing our Upward Spirit and cheering on the teams playing basketball. Maybe in February I will have tons of pictures to post and wonderful stories to tell, but until then this will have to do. 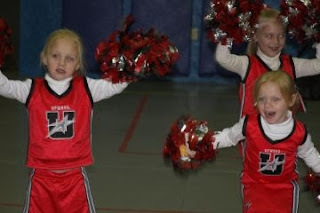 Look at those cute little cheerleaders!!! !